Asuncion Yan Speranza, the Executive Director of the Fundacion Moises Bertoni, is a live wire. When he rose from his chair, he seemed to be jumping up from it. When he decided at the beginning of our early morning meeting to show a power point presentation about the fundacion and its work, he almost ran around the room. He’s a man in a hurry trying to catch up with the devastation of the natural, historic environment of many parts of Paraguay. The foundation is named for the Swiss native, Mosè Giacomo Bertoni, who moved with his whole family and forty other Swiss citizens to northeast Argentina to establish an anarchist, farming community, and ended up in Paraguay after that political project failed. He is most famous now for having been the first scientist to describe the local Stevia rebaudiana plant (Kaa-he-e, or “sweet herb”), which has now become a popular and expensive, alternative sweetener, 100 years later. 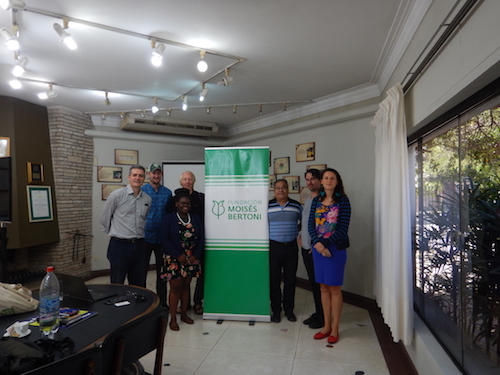 The foundation, was organized in 1988, a year before the fall of the dictatorship, as a land trust based in the United States and chose its name to honor Bertoni’s 19th century commitment to nature in Paraguay. Thirty years later the fundacion’s work is extensive and includes various social enterprises, a girl’s training high school, a blood conversion plant, and other projects, including several nature reserves, but it’s origin story is also its signature project and main contribution to Paraguayan environmental and conservation work, the Reserva Natural del Bosque Mbaracayú. The 158,000 acres reserve is the last major track of virgin Atlantic Forest land in Paraguay. The back story Speranza told us was fascinating. They acquired the property from the World Bank, which had seized the tract as collateral for a loan that went bad to the country. 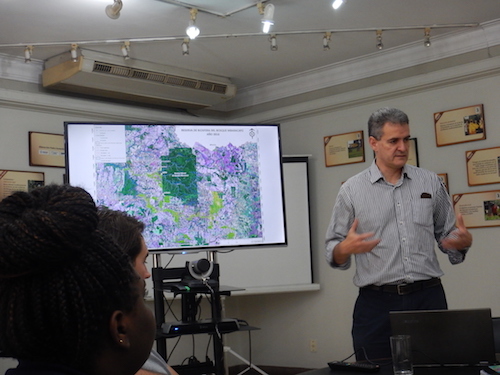 They were preparing to sell the land for $7 million USD to a Brazilian agribusiness company, when the US-based Nature Conservancy alerted Paraguayans to the news, who organized the fundacion and began intensive lobbying to convince the World Bank to halt the sale and eventually reduce the price to $2 million USD, which they then raised successfully including a $500,000 contribution from USAID. Michael Stipes of REM fame and the band also gave them $800,000 over the years, which deserves some props as well. They were stuck trying to figure out how to finance and maintain the reserve though. They solved this problem in a creative, though curious, way. They sold the carbon-credits to AES, Applied Energy Systems, the giant Arlington, Virginia energy company whose properties include Indianapolis Power & Light and power plants they have built and operate all around the world. AES was building a plant in Hawaii that was going to generate huge levels of pollution, estimated at 12 million tons of carbon and 40 million tons of CO2, and paid the Fundacion $2 million US at 15 cents per ton of carbon for the carbon-credits based on the positive emissions from the Reserve. Esperanza was frank in saying that it was an easy deal for them since they were going to be providing that positive impact anyway. Essentially, this carbon credit deal was good for the fundacion and gave AES a cheap break, but didn’t actually add any benefit whatsoever to protecting the environment or offsetting the adverse impact on the climate being created by the plant, adding more fuel to the fire of whether carbon-credits are much more than a corporate scam at the expense of the environment. The fundacion used the money as an endowment, operating on the interest created by the purchase which grew to $7 million USD until 2009’s recession which set them back $2.5 million on their reserves. The biggest problem they face in the Reserve is stopping illegal marijuana cultivation, which they monitor with drones because of the danger, but have failed to get the government to stop. Esperanza mentioned that they were facing the most tragic event in their history since two of their four rangers in a much, much smaller reserve in the southern part of the country, had been killed in recent weeks by poachers there. We were all impressed, and their work is vital in Paraguay. Seeing the Reserve and Gran Chaco in the eastern part of the country, which is the largest forest in South America after the Amazon, needs to be on everyone’s must-see list, and thanks to the work of the Fundacion, no matter how the sausage was made, there’s a chance it will last long enough under their protection for many to witness. This entry was posted in International, Organizers Forum and tagged Fundacion Moises Bertoni, Mose Giacomo Bertoni, Paraguay, Yan Speranza by Wade. Bookmark the permalink.